Why do we celebrate Vijaya Dashami? Here are some of the historical incidents related to Vijaya Dashami apart from the victory of Lord Rama over Ravana on this day. Vijaya Dashami is one of the most significant festivals in the cultural tradition of India. This festival is observed on the tenth day of the bright fortnight in the month of Ashvina (September/October) and is considered an auspicious occasion to start any new venture, purchase new household items or begin a journey. Vijaya Dashami marks the victory of divine power over demoniac forces. It was on this day that Lord Rama killed the ten-headed Ravana, who had abducted His wife Sitadevi. This day is also known as Dashara in this connection. The word Dashara is derived from two Sanskrit words – dasha (ten) and hara (defeat). 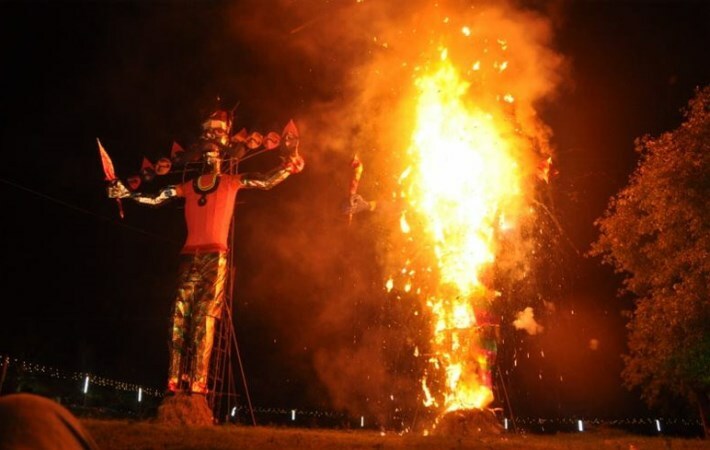 People celebrate this victory of righteousness over evil by burning the effigies of Ravana, his brother Kumbhakarna and son Meghanada. In North India, performances of the Ramalila (a short version of the epic Ramayana) are very popular on this occasion. It is also recommended to recite Sundara Khanda from Valmiki Ramayana on this day. Mahishasura was a powerful demon under whose leadership the asuras waged a war against the demigods and defeated them. The demigods sought the help of Goddess Durga to kill Mahishasura. Durga Devi, the divine mother, mounted on a lion, fought the mighty demon for nine days and killed him on the tenth day. Vijaya Dashami commemorates this victory of Mother Durga over the demon Mahishasura. The nine days preceding Vijaya Dashami are celebrated as Navaratri, when Goddess Shakti or Durga is worshipped in her different forms as Durga, Vijaya, Vaishnavi, Kumuda, Chandika, Krishna, Madhavi, Kanyaka, Maya, Narayani, Ishani, Sharada, Ambika and Bhadrakali. 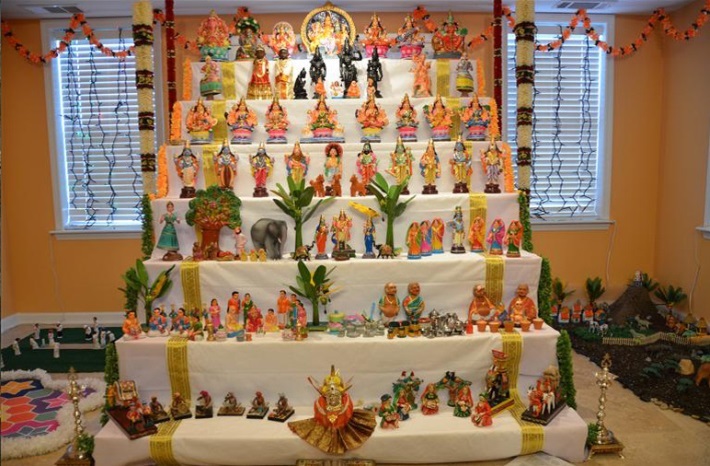 In South India, especially in Tamil Nadu, Andhra, Telangana and Karnataka, the Navaratri is celebrated with Golu display (a display of dolls depicting various events from the Puranas, royal processions, weddings, etc.) and the women invite each other to visit their homes to see the Golu display and to participate in bhajans and kirtans. Durga puja is also celebrated with great pomp and pageantry in West Bengal for five-days culminating on the day of Vijaya Dashami. It is the biggest festival in the state and the celebration takes its most glamourous form in Kolkata. Exquisitely crafted and decorated life-size sculptures of Goddess Durga slaying Mahishasura are set up in the temples for worship. On the fifth day, these sculptures are taken in a procession and then immersed in the river. In Mysuru (Karnataka), Goddess Chamundeshwari (Durga) is carried on a golden throne which is mounted atop a decorated elephant. 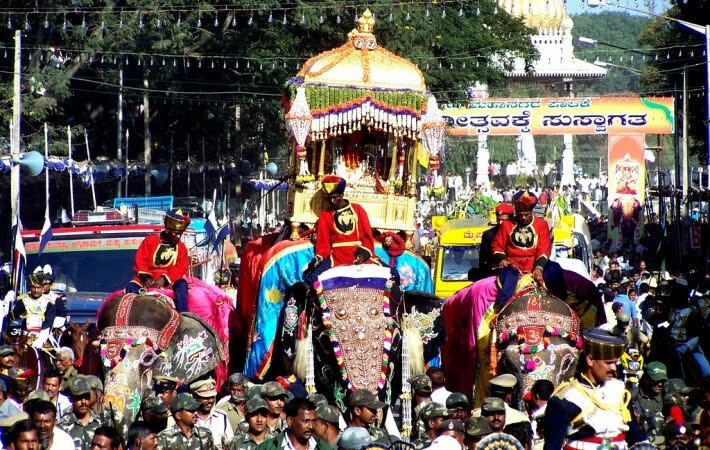 The procession comprising of colorful tableaux, dance groups, music bands, decorated elephants, horses and camels, starts from the Mysuru Palace and ends at a place called Bannimantapa where the banni (shami) tree is worshipped. Why do they worship the shami tree on this day? To know the answer we need to refer the Mahabharata. The Pandavas lost to the Kauravas in a game of dice and consequently they were banished from the kingdom to live in a forest for 12 years and then remain incognito for one year. After completing 12 years of exile, the Pandavas decided to remain incognito in the kingdom of Virata, disguising themselves for the next one year. Before approaching the king, they wrapped their divine weapons in a cloth and kept it on a high branch of a shami tree near the cremation ground outside the city. Since that day, shami trees and weapons have been worshiped on the ninth day of Navaratri (a day before Vijaya Dashami) symbolising this particular incident in the Mahabharata. Vijaya Dashami is considered auspicious to begin your learning. The traditional Vidyarambham ceremony observed mainly in Kerala and Karnataka introduces children formally to learning of music, dance, languages and other folk arts. Another celebration on this occasion in Kerala and in some parts of Karnataka is the three-day Sarasvati puja in which books are worshiped. On the Ashtami day (eighth day of Navaratri) the books are placed for puja and ceremoniously taken out for reading and writing after worshiping Mother Sarasvati, the Goddess of learning on the day of Vijaya Dashami. Vijaya Dashami also marks the beginning of the harvest season. People seek the blessings of Mother Earth for a good harvest, peace and prosperity. The demigods are satisfied by such yajna performances and supply the various necessities of life. The rainfall, breeze, sunlight, moonlight, air, water, light, food grains, vegetables, fruits, minerals, and other raw materials required for our manufacturing enterprises are all supplied by the demigod agents of the Supreme Lord. In India and Nepal, the demigods are worshiped with various offerings and by sacrificial performances (yajnas) and religious rituals at the beginning of every harvest season on the day of Vijaya Dashami. In some parts of the country, people sow pulses, cereals, barley or the nine types of grains (nava dhanya) in a pot and water it every day during Navaratri. The sprouting of these seeds is considered a sign of prosperity.